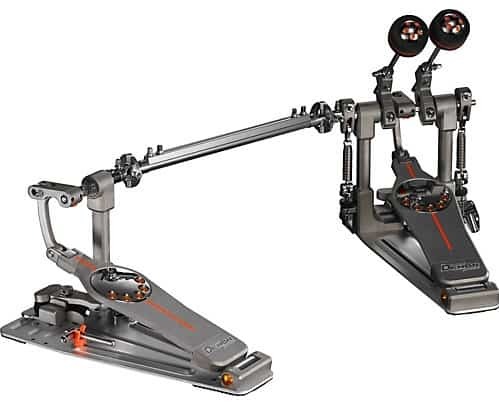 Are you looking for the best bass drum pedals? If yes, then keep reading because this article is for you. A bass drum pedal is a must-have gear of every drum set, and it comes in three different playing styles. This includes a single bass drum pedal, a double pedal and two single pedals with the option to play them separately. We have covered all three types and reviewed different products available on the market. 2.1 What is a Bass Drum Pedal? 2.2 Single or Double Bass Drum Pedal? 2.3 What is The Best Type of Transmission? 2.4 What Type of Pedal to Choose? 2.5 What Adjustment Options Do I Need? 2.6 Do I Need a Left-Handed Pedal or a Right-Handed Pedal? 2.7 Is My Bass Drum Pedal Compatible with a Cajon? 2.8 What Is The Best Type of Base? With these pedals, you will be able to produce a great bass sound. To help you out narrow down your options to the most quality products on the market, we have prepared a list of 17 best bass drum pedals. Take your time to go through their specifications and then make your choice. 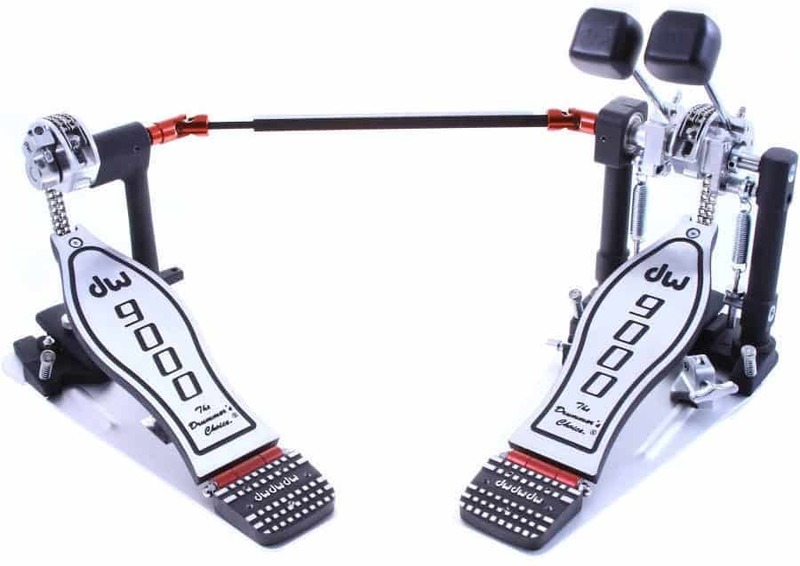 The DW 9000, from the DW Drums 9000 series, is a stable and solid bass drum pedal. Equipped with three rubber feet that swivel 360 degrees, its patented Tri-Pivot Toe clamp ensures reliable attachment to any kick drum circle. This results in better contact between the pedal and your bass drum, which greatly improves the playing feel. The new Dual-Bearing Spring Rocker spring suspension provides more flexibility. Also, its stabilizer plate is covered with a non-slip coating, and its bat has two different striking surfaces: one made of felt and the other of plastic. 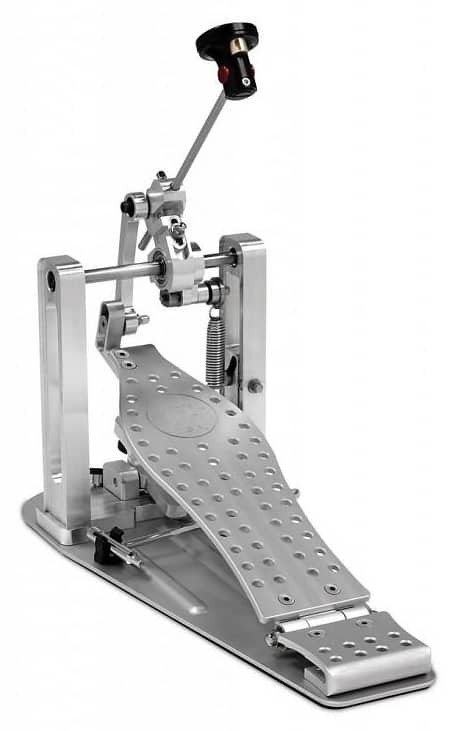 And as you would expect from DW Drums, this bass drum pedal is of very high quality. In short, this pedal will accompany you for many years, whether you are a beginner or an experienced drummer. 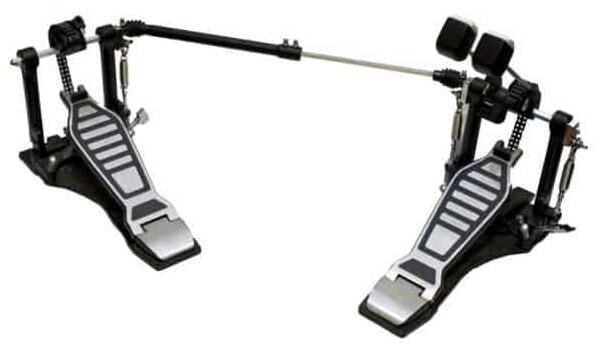 The Tama HP910LWN is the most affordable bass drum pedal in the successful Tama Iron Cobra series. This offers high performance while remaining affordable. The HP910LWN ‘s bat is driven by a simple chain. The Power Glide cam ensures precise feel without sacrificing power and speed. 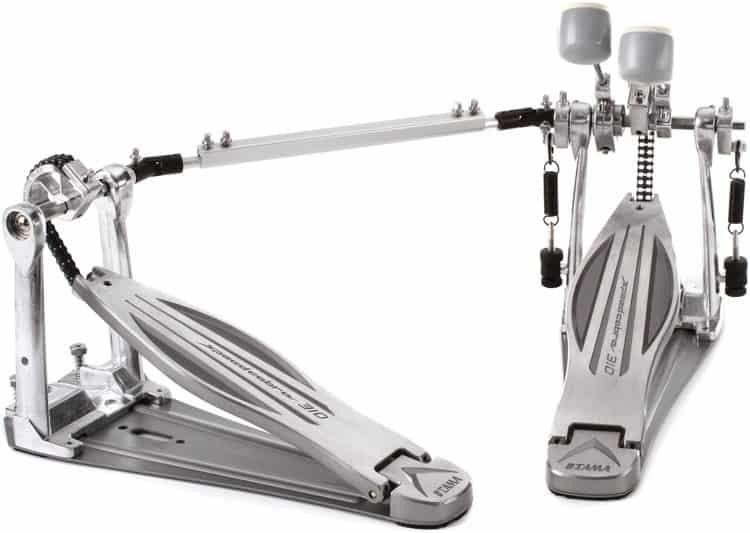 Solid, this bass drum pedal can be used in all styles of playing and music. 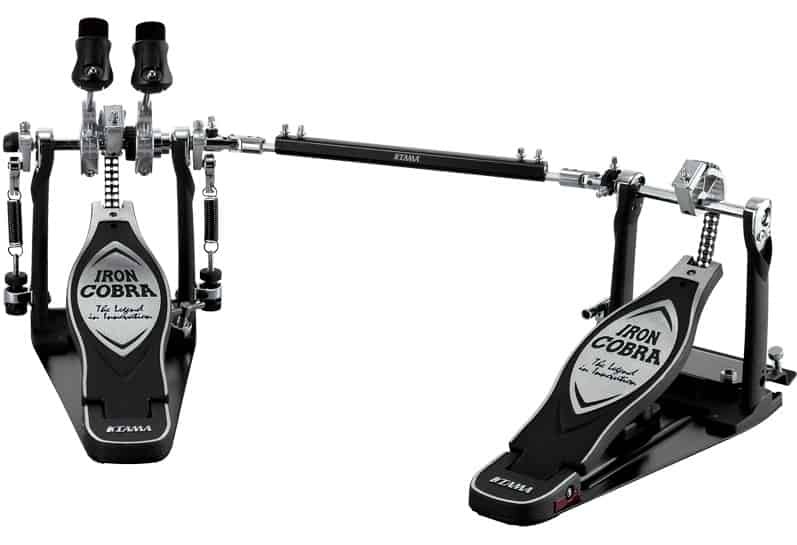 With the Iron Cobra series, Tama offers a selection of bass drum pedals that can be adapted to a drummer’s playing style without sacrificing performance. Thus, the HP910LWN allows modifying the pedal position and the angle of the bat. It is also possible to adjust the spring tension, which allows a perfect response. Also, the Spring Tight system prevents the spring from rotating, allowing a soft and light touch. With cutting-edge technology, DW MDD Machined Direct Drive Single Pedal is one of the best bass drum pedals you can ever have. Though this is the single pedal version, it also comes with double pedals with a higher price tag. While its design is a fantasy of its own, the aluminium construction really gives it a lightweight profile without sacrificing its durability. Upon close inspection, we found that its pedal layout was somewhat conventional and was designed with almost little to no panache. Also, if you see its two upright posts, both of them have clear lines with a cigar-shaped aperture and nicely polished exterior which looks great. Its feel would appeal to you, especially the chain drive players. You can easily assemble it in a natural and smooth action. Also, just by turning a few of its bolts, you can easily reconfigure it to the other end of the scale and get that aggressive speed driven machine for some blasting beats. An advanced level pedal which offers sensitivity and control at the same time. Its refined and well-engineered design makes it one of the smoothest, versatile and fastest pedal in the world. It features ultra-light weight Power Chain with very low friction rollers, offering better speed, while the double chain construction results in more power. The perfect circle cam on this pedal offers a linear response along with a consistent and smooth feel throughout the stroking time. This results in accuracy and control. This is, in fact, a racing-inspired Cam which is designed to minimize and maximize your speed and power control at the time of playing the drum. For more speed and a solid built it features NiNjA precision skateboard bearings which are micro-polished with absolutely no friction. The duo-deck of this pedal allows you to easily convert it from a shortboard to a longboard within a matter of few seconds. Overall, it offers better stroke adjustment, speed and playability with maximum precision and pinpoints accuracy. Though there is nothing special in the design of Tama Iron Cobra 900 as it has remained same for a while now, but this doesn’t put any question on its performance. There are some new improved features which really turned this simple pedal into a beast. Firstly, its width has been modified to eliminate any chance of side to side movement which is great. Also, the baseplate has been increased in width which gives you a better and stable platform while playing. The new thing in Cobra 900 is its beater design. At a glance, it may appear small in diameter but guess what, it is a lot deeper than before which is a plus point here. This beater features a thick black foam which results in that punchy low to mid-frequency response right of the bass drum. Another new feature worth mentioning here is its Lite Sprocket which comes with 40% less mass as compared to the previous cam, being smoother and lighter. Overall, this pedal is flawless and guarantees smooth and agile playability throughout the drumming session. 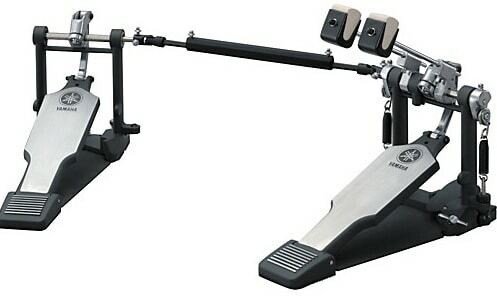 If you are looking for a drum pedal with the smooth and quick response, Yamaha DFP-9500D might be your answer. It is a direct drive pedal which comes with a durable cast link between its rocker shafts and the main foot boards. What’s unique is this pedal will push the footboard back on rebound, offering the fastest response than any pedal on the market. You can even play it heel down with no trouble at all. Moreover, its beater angle, footboard angle and spring tension can be easily adjusted so you can modify it as per your playing style. Moreover, there are stabilizer bars built into the pedal frames just below the rocker shafts which eliminates flex and helps to keep the bearings in alignment while offering you a very smooth feel. There are teardrop-shaped holes within the beater hubs, and this securely holds its shafts and prevents them from spinning. Furthermore, it has two double-sided beaters on one side along with hard plastic on the other. It also features a side-adjustable hoop clamp which helps to hold firmly to the kick drum hoop and tightens its wing bolt. This pedal is known for its precise design and well-engineered features while having the simplicity of its own. It comes packed in a shoebox style box which has a smooth skin like exterior. Inside the box, there is a small pouch of silica gel as well to keep the pedal in new condition. You will find clear instructions on how to setup the pedal. The pedal shines in silver and is light in weight with a smooth and mirror-like footboard. Just underneath its silver base plate, you will find a slightly rougher silver frame assembly along with black rubber pieces which are used for the strap, button and also to cushion the bass drum hoop. Its heel plate is nicely assembled with Jojo Mayer’s “Perfect Balance” design. There is a Sonor drum key, self-adhesive hoop guard and Allen wrench so you can easily assemble it. Overall, this pedal gives you a simple yet advanced level playing action and has no bumps, engraving logos or surface textures which might hinder your sliding motion. The Tama HP310LW is known as the lightning fast pedal which comes at a reasonable price tag. It has all the features of its brood mate. Just like the other Tama bass pedals of the Cobra series, it has an ultra-lightweight design which not only helps with assembling but also smooth playing. It has dual chain double pedal with a longer footboard which helps you to accelerate the power and speed of its beater stroke rapidly. Since it offers a very smooth playing surface with reduced friction in between your foot and footboard, you won’t have to put any excessive efforts to keep the bass drum beating. Moreover, its unique recessed position really gives you a perfect balance between its natural playing feel and lighter action. It also features LiteSprocket for a super natural feel and smooth action. Its overall weight is 40% less as compared to Iron Cobra’s sprocket, and thus this gives you the easy of playability and adjustability. If you are looking for a nice addition of bass pedal to get that deep bass drum sound, Pearl P932 Demonator Right Footed Single Chain with Interchangeable Cam Powershifter can help you. It features some of the most advanced features which makes it an award-winning pedals around the world. Though it is a single chain drive pedal, it comes equipped with the Demon Style Powershifter long-footboard. What it does is makes it easier for you to pedal it and at the same time offers you a proper grip for accuracy. It also features a patented interchangeable cam along with infinitely adjustable beater angle which lets you customize this pedal as per your playing style, power and feel. This helps a lot in getting comfortable with the pedal and get that bass into the system. There is a Click-Lock spring tension keeper with Control Core Beater which offers you that finishing touch, making this pedal extremely versatile. 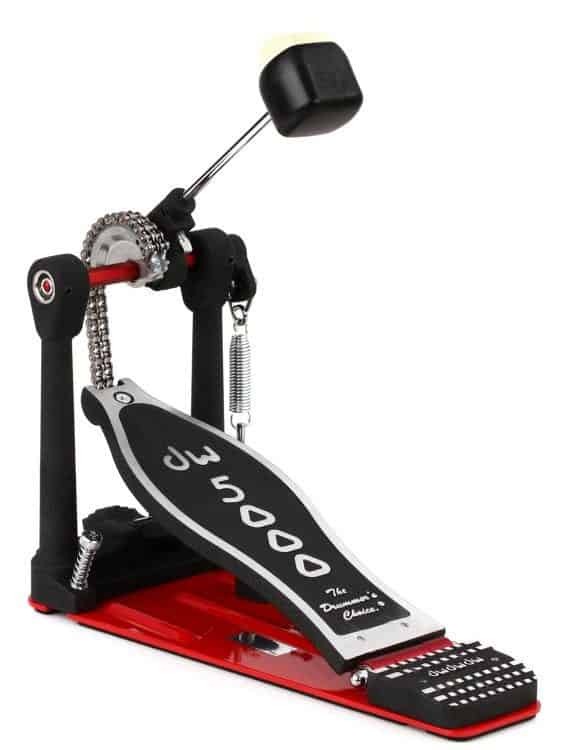 Say hello to the legendary DW DWCP5000AD4 Accelerator Single Bass Pedal which has all the features a drummer needs. It helps to create a link between the sprocket and footboard, resulting in maximum velocity and outstanding sensitivity. Its new design has improved features and innovative rubberized tri-pivot toe clamp, textured rubber grip and a dual-bearing spring rocker which offers frictionless action. Best of all, it is easily customized as per your playing style. Its tri-pivot toe clamp, nicely, securely and gently hoops up and ensures that the pedal and drum remains in contact. Don’t worry about the hoop size or angle that won’t be a trouble. There are three contact points on its clamp system which are covered in rubber. This offers you a secure connection and prevents the hoops from any damage. Also, the rubber grips used prevents the bass drum creep. This is a non-skid grip and helps to keep your foot firmly on the pedal while you play it like crazy. Overall, this pedal offers exceptional performance and smooth transition throughout your playing session and helps to produce a deep bass drum sound. 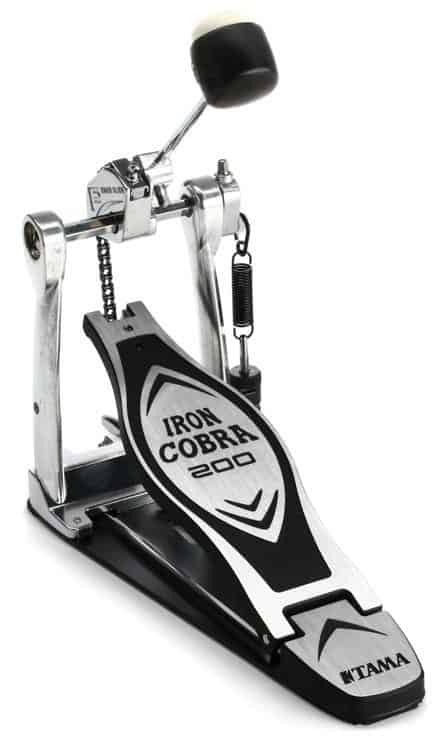 The Iron Cobra 600 is a limited edition bass drum pedal which has gained a lot of popularity among the drummers around the world. The first thing to notice in it is the Cobra beater which adds a lot to the overall looks, sound and functioning of this pedal. Secondly, the double chain drive used is durable and results in smooth and accurate motion. Its Duo Glide feature makes it a lot easier for you to quickly switch between Power Glide cam for increased power and speed and Rolling Glide cam which offers a smooth and consistent feel throughout the stroke. It comes with a stunning jet black finish with a focused sound and improved control. Of all the features, the unique and noteworthy is its Duo Glide Cam. This is a pretty simple adjustment which offers a super-fast change between true sound “Rolling Glide” sprocket and an offset “Power Glide” sprocket. As a drummer, you can choose whichever style suites you the best. Moreover, Iron Cobra 600 has an improvised hinge design which offers you a precise footboard action along with ball bearing equipped “Speedo-Ring” rocker cam. Overall, it is a durable and feature-rich pedal which will help you get the most out of your playing session. 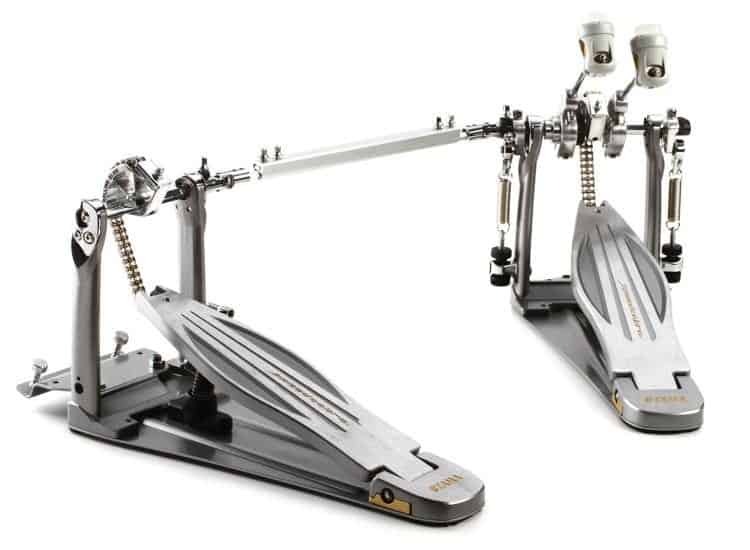 Just when you thought that a double drum pedal might be an overlooked piece of hardware, the MAPEX P500TW comes to the rescue with its single-chain double bass drum pedal. This pedal features reversible beaters along with adjustable spurs. While it is extremely durable to last for years to come, it also offers exceptional performance at a very affordable price which makes it stand out from its competitors on the market. Since it has a single chain drive mechanism, not only will you get better durability as compared to a traditional drum pedal but also better performance, speed and power. There is an option of softer sound using its reversible beater just in case you want to adjust the sound from the hard slap of plastic. This pedal also comes with retractable floor spikes. This helps the bass drum and pedal from sliding around while you are pedalling at your peak. Overall, Mapex 500 offers an extreme level of adjustability to easily fit to any playing style and is designed for durability, playability and reliability. 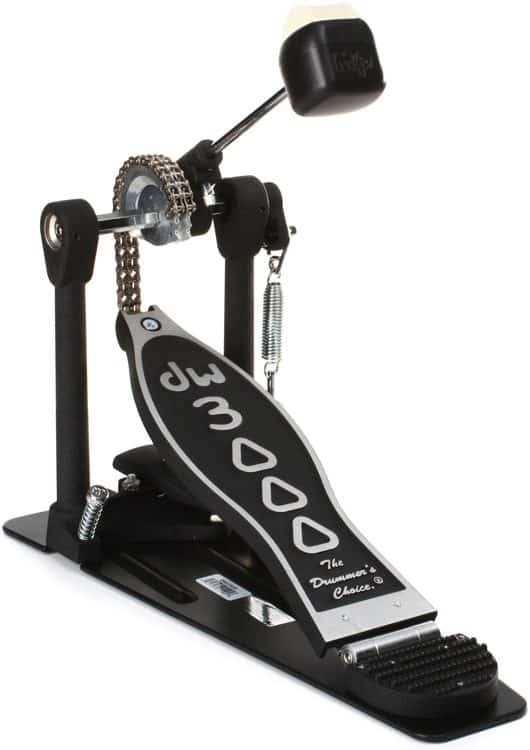 The DW 3000 Single Bass Pedal is popular because it is designed for every drummer. It comes packed with dual-chain turbo drive with a bearing spring rocker assembly, 101 2-way beaters and a heavy duty all metal construction. Its 101 2-way beater is of the industry standard reversible beater and features a high-impact plastic and felt surfaces which allows you to cover a range of musical applications. The dual chain turbo cam used with chain and sprocket design with offset cam gives you a quick response. DW 3000 features a solid steel base plate which is the sturdy foundations and also ensures nonskid play on carpet or any other flooring surfaces, thanks to the adjustable spikes and Velcro. The dual adjustable toe clamp makes sure that the pedal and bass drum stay connected when you are busy playing. A clip with drum key is included to make it possible for you. Overall, it is a nice drum pedal with plenty of features which give you the best playing experience ever. The DW 2000 Single Bass pedal is a rock-solid bass drum hardware which is typically designed for students and working drummers. It comes with all-metal constructions with playability making it the best choice for drummers. It also has 101 2-way beater like the DW 3000 series along with single chain cam for a quick response. The steel base plate provides you with a sturdy base plate to prevent skidding and comes with adjustable spikes and Velcro. 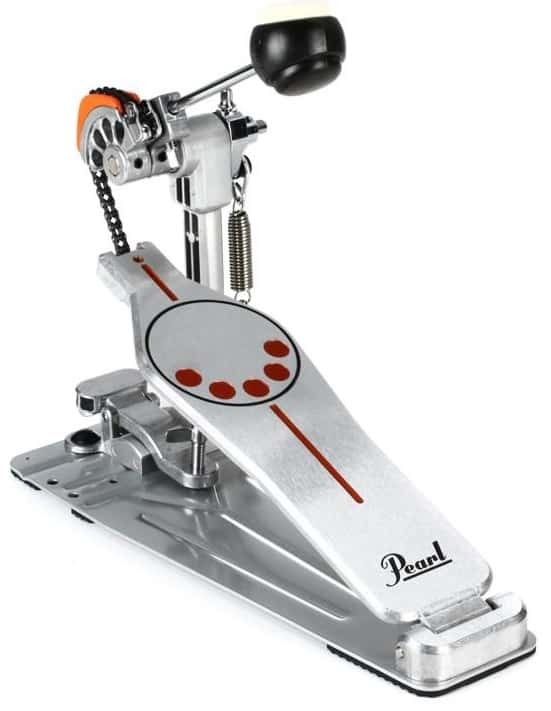 Pearl P930 is an award-winning bass drum pedal with a nice and sleek design. Though it is a single chain drive pedal, it is equipped with Demon Style PowerShifter Function with a long footboard. It has a patented interchangeable cam with multiple adjustable beater angles which allows you to quickly customize the pedal as per your desired feel and power. The Click-Lock spring tension used helps to keep and control core beater for those finishing touches, making it a versatile pedal. Overall, the Pearl P930 is an amazing bass drum pedal with plenty of features. 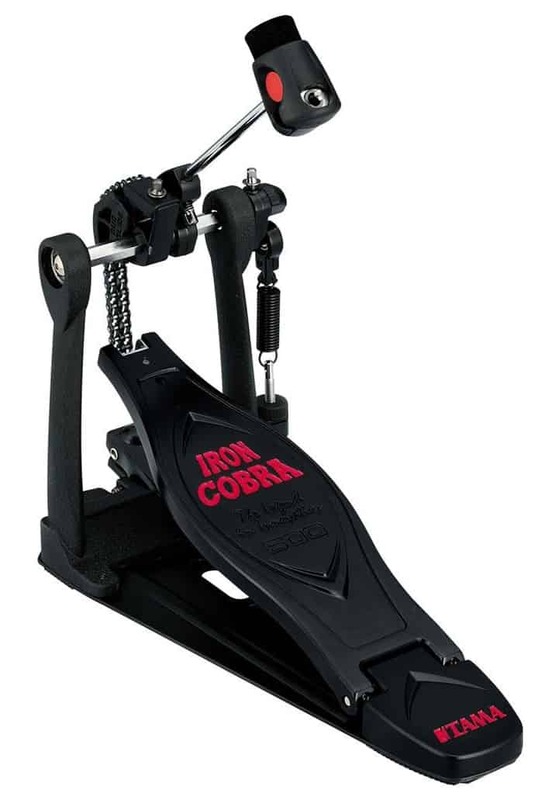 The TAMA Iron Cobra 200 Single Pedal is the next evolution bass drum pedal which offers high performance at a very affordable price. It provides you with a smooth, quick feel without the sacrifice of power or speed. The dual-sided beaters provide a nice variation in kick sound, and the para-clamps used to offer quick and firm grip on bass drum hoop. 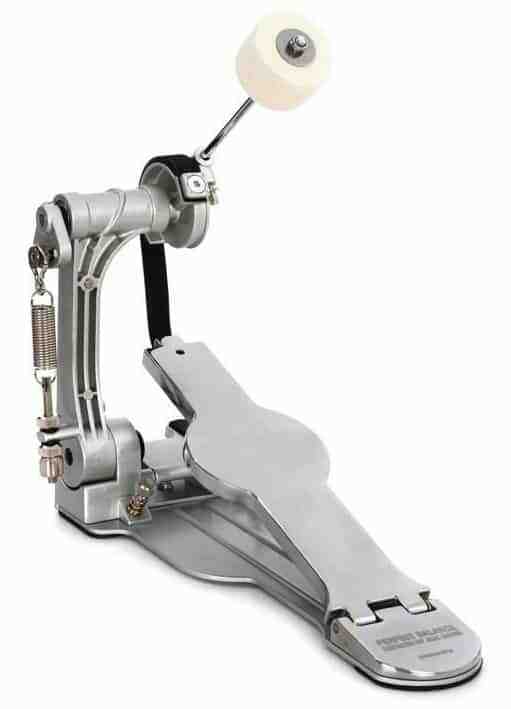 The Gibraltar 5711S Single Chain CAM Drive Single Bass Drum Pedal offers lightning-fast response and comes with superior stability. It has a simple design with fast-acting pedal. It also features signature touch “G” pedal board design, a dual surface balanced bass drum beater, Steel Rock stabilizer plates, cast frame with the beautiful texture black finish and a smooth overall transition. The bass drum pedal is an essential part of a drum kit. Each drummer develops his preferences as to the type of bat, the transmission and the adjustment possibilities of his pedal. This purchasing guide is designed to help you find the model that best suits your needs. The bass drum, the largest part of a drum set, is usually played with the pedal. The footboard is the platform on which you put your foot. By the action of your foot on the sole, the bat is set in motion and strikes the skin of your bass drum. Thanks to a spring, the bat can return after being actuated. Single or Double Bass Drum Pedal? If you are a beginner, it is recommended to opt for a simple bass drum pedal. 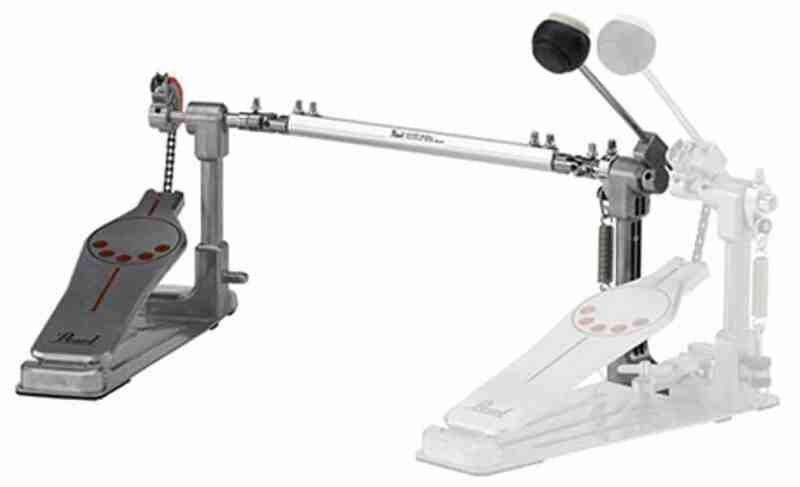 A double bass drum pedal is used on a single bass drum. One of the pedals is equipped with two bats that are operated with both feet, which makes it possible to hit twice as fast. Generally, this technique is only used by experienced drummers. If you use two bass drums, you will need two single bass drum pedals. What is The Best Type of Transmission? The transmission is the element that connects the sole to the bat. For beginners, it is recommended to choose a chain drive, which can be single or double. In general, a simple chain is sufficient. If you like to hit hard, a double chain will be a good choice. The belt-drive is also suitable for beginners. Direct drive pedals are primarily intended for experienced drummers. What Type of Pedal to Choose? If you are just starting out, we recommend a felt bat. This last one allows obtaining an excellent sound which will be at ease in all the styles. Plastic or wooden bats offer more attack and a more defined sound, but they require more training. Most bass drum pedals have a bat with several striking surfaces. Most drummers prefer a felt surface. What Adjustment Options Do I Need? If you have just started the battery, the important thing is to be able to adjust the spring tension. Fortunately, today’s pedals all offer this possibility. You don’t necessarily need to be able to adjust the angle. Moreover, the type of cam you use doesn’t really matter if you’re a beginner (The cam is the system to which the bat and chain are attached – or some other type of transmission. It determines the angle of the bat strike on the skin relative to the sole). Do I Need a Left-Handed Pedal or a Right-Handed Pedal? If you own a simple bass drum pedal, both are possible. On the other hand, if you use a double pedal, you must pay attention to the side on which the bats are located. When your Charleston is to the left of the snare drum, the bats should be on the right pedal. If your Charleston is placed to the right of the snare drum, the bats should be on the left pedal. Is My Bass Drum Pedal Compatible with a Cajon? In general, bass drum pedals are not compatible with cajóns. In the case of a Cajon pedal, the sole and the base (with the bat) are separate elements that are connected by means of a cable. Therefore, you can put the pedal right in front of you, while the base equipped with the bat is fixed on your Cajon. We recommend you to choose a felt bat, because wooden or plastic models may damage the striking surface of your cajón. In addition, a felt bat provides a better sound. What Is The Best Type of Base? The pedal base is the part of the pedal that rests on the ground. If you want exemplary stability, opt for a fixed base. Indeed, although not foldable, pedals equipped with a fixed base are very solid and generally have a non-slip coating on the bottom. As such, they offer excellent playing sensations and robust construction. For easy transport, a cover or case is essential. If you want to have the possibility to fold your pedal, choose a model without a base, but equipped with a hook. These pedals offer a slightly less robust construction than the fixed base models. So, they tend to move horizontally with a strong play, which is a thing appreciated by some drummers. It is, therefore, a matter of personal preference. Having the best bass drum pedal can help you add that punchy and deep bass drum sound to your track. I hope this guide helped you out with everything you need to choose the right pedal. If you have any questions, feel free to leave them in the comment section. Don’t forget to share this guide and subscribe to our newsletter.